So after having seen The Book of Mormon in Sydney for the 3rd time (that’s right; I’ve gone three times), I think it’s safe to say that I can provide a pretty sound, detailed review of this entertainment gem bestowed upon us by the South Park gods. I’m talking about Trey Parker and Matt Stone, the brilliant minds behind Cannibal! The Musical, Team America, and of course – everyone’s favorite lewd, crude, satirical cartoon. Being a fan of all things controversial, it’s no surprise to me that these two ended up coming out with just as lewd, crude, and no-holds-barred of a comedic satire dedicated to none other than the Mormon religion. Apparently the idea came to them on a night out with Frozen’s creator, Robert Lopez, after the duo decided to catch his own Broadway production Avenue Q and were noticed by both Lopez and his co-composer, Jeff Marx. The quartet ended up bonding over the idea of writing something about Joseph Smith, the great founder of Mormonism. And the rest is history. 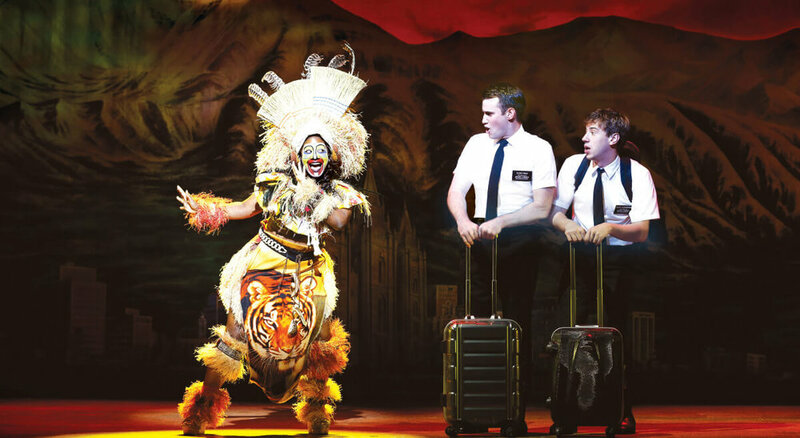 Ryan Bondy, Zahra Newman, Nyk Bielak and company in The Book of Mormon. © Jeff Busby. So I’m one of those apparent ‘weirdos’ who likes listening to entire soundtracks of musicals before ever seeing them live. You can chalk it up to being too poor to hop on a plane to New York, or simply living in cities that don’t always have my favorite stage productions come to town. And I don’t know about the rest of us musical fans, but I’m not about to wait five years until Dear Evan Hansen makes its way to the land down under just to hear Pasek and Paul’s newest (and fantastic, by the way) masterpiece of a soundtrack. The same goes for Hamilton. Despite having previously listened to each and every one of the songs, it in no way sullied my thoroughly enjoyable experience of Sydney’s The Book of Mormon. And so I ended up seeing it for a second time. Months later, when I discovered that they had yet again extended through to early 2019, I picked up a handful more from their last call. And thus, here I am – still high from my third viewing… so I might as well write about it. My third time around, I was able to catch an almost completely different cast – who had their own, fresh take on the songs and characters. But since I’ve been familiarized with the original Sydney cast during my first two viewings, I’ll be focusing on these set of actors instead. The original set I watched included a terrific Ryan Bondy and an adorkably delightful A.J. Holmes, playing the respective leading characters: Elder Price and Elder Cunningham. Zahra Newman graced the stage as a vocally-powerful Nabalungi alongside Bert LaBonte as Mafala. Of course, who could forget the tap-dancing Elder McKinley – a closeted gay Mormon in a hilarious state of denial, played by Rowan Witt. Ryan Bondy, A.J. Holmes and company in The Book of Mormon. © Jeff Busby. Having replayed the original Broadway cast’s Tony Performances on YouTube (and shoving these videos in the faces of friends and family), I did admittedly have a tinge of anxiety over whether the Australian casting would ‘hold up’. Andrew Rannells (the original Price) and Josh Gad (the original Cunningham) were just so perfectly perfect for their roles, voices and all – that it was hard for me to picture anyone else in their pressed shirts and polished black shoes. But boy, was I wrong. Bondy and Holmes absolutely killed it as our two leading heroes, and Newman wow-ed the crowd with vocal notes that made me suspicious of a possible backing track. Nope. Those were all raw, human vocal chords. I swear I heard an angel (Moroni?) cry. Bondy played Price with a Jim Carrey-esque flair that gave the character an wonderfully cartoony touch. As the goody-two-shoes-teacher’s-pet missionary, he carried an entertaining amount of exaggerated (yet, convincing) eagerness and enthusiasm throughout the show. Even as Price’s unfortunate Ugandan encounters eventually lead him to his breakdown, Bondy was also able to depict grief; with just enough hint of comedy. Holmes added his own spin to the loveable Elder Cunningham. He evidently didn’t have the same physique as the original Josh Gad portrayal, but it didn’t matter – he still brought the role to life with the perfect dose of naivety and entertaining obnoxiousness, laced with enough sincerity to make you feel for the character. But it wasn’t his Cunningham-isms that truly impressed me – it was this dude’s vocals. While Gad maintained his trademark Olaf-like voice on the original soundtrack, Holmes added more of a rockstar vibe to his singing, which was particularly noticeable during his solo, ‘Man Up’. Though I was expecting the goofiness of Gad in his songs, it was a pleasant surprise to be able to hear a melodious, rock-pop take on the character’s pieces. As much as I love Gad and every role he’s played – Holmes may have actually won me over as my more preferred Cunningham due to this. As I’ve said, Newman was a showstopper, and so was Rowan Witt. The outwardly flamboyant Elder McKinley was truly brought to life onstage with the razzle-dazzle eccentricity you’d expect from the character. He killed it during “Turn It Off” – vocally, choreography-wise, and all. And last but not least, Bert LaBonte got the show going with “Hasa Diga Eebowai”, playing Mafala down to a T. His rendition of the song was nearly identical to that of the original recording, and I mean that in the best way possible; his singing and portrayal was flawless. Though he only had one solo, and made only a few minor appearances throughout, he delivered his lines with perfect comedic timing, making it a constant joy to have him onstage. The rest of the ensemble were superb with all their choir blends and harmonies and oh-my-gosh-how-were-they-so-in-time-with-their-dance-moves-like wow. I’ve really got no gripes here at all with the Australian cast – while the original Broadway crew will always have a special place in my heart, these guys knocked it out of the park. Zahra Newman and A.J. Holmes in The Book of Mormon. © Jeff Busby. The premise follows our two leading heroes, Kevin Price and Arnold Cunningham as they venture off into a war-torn Ugandan village to spread the good Mormon word and rack up a few new converts in their wake. Passionate and determined, the duo soon realise that their mission may prove a tad more challenging than expected, as they find themselves entangled among an incredibly anti-religious community and their trigger-happy village warlord. Unlike few other musicals that focus more on performances and score rather than the actual story itself, it’s safe to say that The Book of Mormon had a simple yet engaging (and hilarious!) story with a memorable moral point, not unlike your typical South Park episode. Though Parker, Trey, and Lopez go gung-ho on their mockery for the musical’s entirety, it surprisingly still carries a hint of sweetness and sincerity in its message. It rips the concept of organised religion apart, yes; but ultimately reveals itself to be this feel-good tale of spreading good and hope in the world, no matter what beliefs you may hold. The set was better than I had set my expectations for, presenting a Cameron Macintosh-like seamlessness between each and every scene. The production grips you with a wide range of designs and themes – from the sweltering, dry scenery of a downtrodden Ugandan village to a rock concert stage exploding with multi-colored lights and smoke effects. Phyre Hawkins, Ryan Bondy, and A.J. Holmes in The Book of Mormon. © Jeff Busby. Settings transition from scenes with large depth and dimension, looking far bigger than you’d think the stage would initially be; to two-dimensional backdrops that create a more delightfully cartoony spectacle. Some of the best eye-candy in terms of stage design would have to be Elder Price’s imagining of a ‘Mormon hell’, Elder Cunningham’s solo concert stage, and of course, their little village community in Uganda. And now we’ve come to my absolute favorite bit about this musical – the score and soundtrack. I literally have no qualms. The Book of Mormon, by far, probably holds the record of ‘most played’ on my Spotify playlist amongst all genres, and is probably the one Broadway soundtrack that I can listen the entire way through without getting bored or finding a ‘throwaway’ song. Every single piece is comprised of an incredibly catchy tune, witty lyrics, and (on the original Broadway recording, at least) the wonderful vocals of Andrew Rannells (Price), Josh Gad (Cunningham), and Nikki M. James (Nabalungi). The music is like something you’d find in a Disney movie: memorable and addictive, but with the hilarious vulgarity of Parker and Stone. You’d need a severe aversion to music to not like a single track on the album – and I can confidently assure you that at least three of the musical numbers will run racetracks in your head for days on end. Ryan Bondy and Augustin Aziz Tchantcho in The Book of Mormon. © Jeff Busby. If I absolutely did need to pick out a ‘throwaway’, it may have to be ‘Joseph Smith American Moses’ for its lack of a catchy melody (compared to the rest of the numbers); but what it misses on the recording, it makes up for on stage with a hilarious skit on a botched re-imagining of the Mormon religion’s history. Overall, if you like your Disney songs with a side of obscenity, then this is the soundtrack for you. So, will I see The Book of Mormon again? Likely. Show me good seats and a good ticket deal and I’ll be one of those overly-excited fans in the audience whooping each performance during the applause. As an avid fan of Broadway and musicals and the theatre, this production just hit all the right notes (heh) – but I’ll recommend it to anyone, wannabe-thespian or otherwise, looking for a solid night of entertainment and quality, offensive comedy.